Blonde Ambition Grass at the Denver Botanic Garden entrance. The latest horticultural trend in ornamental grasses has been the introduction of many new cultivars of our native grasses. Initially, most all the ornamental grasses in the trade were of European or Eurasian origin because the European nurseries were the ones exporting these new plants to the US. But it became apparent that there are also many great grass species native to North America. And the interest in Prairie Switch Grass (Panicum), Indian Grass (Sorghastrum), Little Bluestem (Schizachyrium) and Muhly Grass (Muhlenbergia) has expanded tremendously. As have the number of selections available to US gardeners. ‘Blonde Ambition’ Blue Grama Grass (Bouteloua gracilis) - has a unique look to its flower spikes and seed heads that makes it a great companion for so many other grasses and perennials. It’s extremely adaptable thriving in heat and cold, grows equally well in all types of soils including clay and provides 5 to 6 months of ornamental interest from mid-summer through into the following spring. And it’s big; twice as big as common blue grama grass giving it tremendous impact in the landscape. ‘Windbreaker’ Giant Sacaton Grass (Sporobolus wrightii) is the Paul Bunyon of all the native grasses with its huge size and dramatic presence. This strain was Originally developed at the USDA Los Lunas Plant Materials Center in central New Mexico. They wanted a giant grass for use as a windbreak to border vegetable fields in the Southwestern US. But when I saw the field of plants they had been breading for agronomic purposes, their ornamental value was instantly apparent to me. Bred for size, ‘Windbreaker’ is also different because the plants can have flower spikes in shades of blonde, bronze and burgundy. 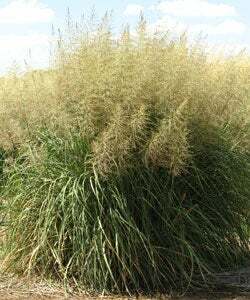 This is unlike the common Giant Sacaton grass which is much smaller and blooms blonde. 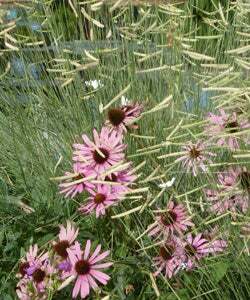 Grasses are some of our most low care perennials. They only need three things each growing season. They need to be cut back at the appropriate time. They need to be cut back very low to the ground. They need to be fertilized in the fall. they leave standing too much stubble. One of the biggest mistakes I routinely observe is that when gardeners and landscapers cut back their ornamental grasses, they leave standing too much stubble. Cut back these grasses hard, leaving only 2 to 3 inches of stubble, not 8 to 12 inches. Leaving the grass stubble too tall smothers the center of the grass and causes them to die out in the center. And wait until mid-spring to trim them back. Cutting grasses back in the fall robs you of their ornamental interest over the fall and winter months. This advice is for warm season grasses (grasses that green up in late spring and bloom from mid- to late summer into the fall) such as Switch Grass (Panicum), Indian Grass (Sorghastrum), Little Bluestem (Schizachyrium), Muhly Grass (Muhlenbergia), Blue Grama Grass (Bouteloua) and Giant Sacaton (Sporobolus). Don’t cut back cool season grasses to the ground. 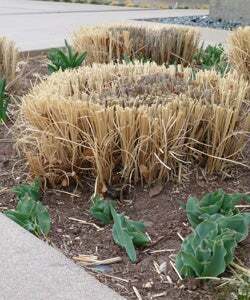 These grasses stay semi-green through the winter and wake up early to bloom by late spring. They include ornamental Fescue (Festuca ), Blue Avena Grass (Helictotrichon) and Silky Thread Grass (Nessella). These grasses should be combed out vigorously with gloved hands in late fall to give the blades room to grow out in the early spring.